Stephen Kirchner and James Taylor, students in the Department of Electronics and Computer Engineering Technology, won first place in the design contest at the Institute of Electrical and Electronics Engineers’ Region 5 Annual Conference April 20 and 21, 2012, in Tulsa, Okla. 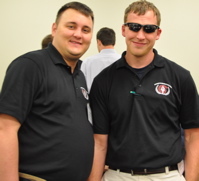 The UALR team beat out teams from Texas, Oklahoma, and Louisiana to win the $500 first place prize. The team was among 16 others given a blind engineering problem. Each team had to design, build, and demonstrate a working model as well as make a presentation to the judges. In addition to the UALR team win, Dr. Hirak Patangia, professor of engineering technology and counselor of UALR’s team, was presented the Region 5 Outstanding Counselor Award. “It was a day-long contest, from 8:10 a.m. to 5 p.m., requiring integration of knowledge from various subject areas,” said Patangia. “Our ECET students had also won the first place in the design contest last year. The consistency speaks well of our students, faculty, and the curriculum. In Region 5, our students have the highest record of winning in design contests,” he said. The 11 UALR students represented the ECET Department and Systems Engineering against teams from universities in Louisiana, Texas, Oklahoma, Missouri, Kansas, Colorado, New Mexico, South Dakota, Wyoming, and Illinois. The students fielded teams in circuit design and professional ethics, as well as two teams in the robotics competition.